Workers put the sign on the south side of the Fred & Pamela Buffett Cancer Center into place. 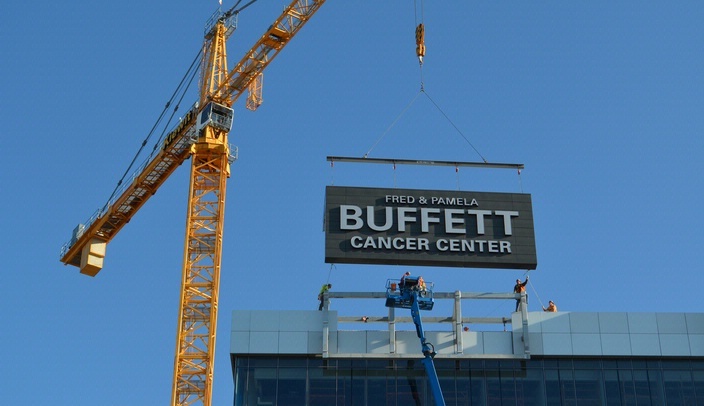 Two large exterior signs identifying the Fred & Pamela Buffett Cancer Center were placed on the building Monday by Kiewit Building Group. The 615,000-square-foot cancer center is located on the campus of the University of Nebraska Medical Center/Nebraska Medicine on Dewey Avenue between 44th Street and Durham Research Plaza (formerly 45th Street). The two signs are identical. One was placed on the north side of the building, the other on the south side of the building. The cancer center is scheduled for completion in the spring of 2017. Since the project is near completing use of the existing tower cranes, the sign installation had to be scheduled before the cranes were removed, said Kathy Bauer of Tetrad Property Group, the company which is providing owner’s representation services for the new facility. Unlike other signs that are installed in sections on a building, these signs featured a unique unit assembly system that allowed the signs to be completely assembled at ground level. They were then hoisted onto the building in one piece. Kiewit monitored weather conditions to determine the install date. "Because of the size of the signs and the fact that we needed to use a crane for placement, it was important that we have minimal wind during installation," Bauer said. Several Omaha firms were involved in the signage project. They included: HDR - completed the design for the signage; Architectural Wall Systems - locally manufactured and assembled the sign frame; ASI Signs - fabricated the lettering; and Christensen House Moving - transported the signs to the UNMC/Nebraska Medicine campus. The signs weigh 8,000 lbs. each. In addition, there is another 1,400 pounds of weight in the associated rigging needed to put the signs in place. They are 36 ft. long, 16 ft. tall, and 13 ft. deep. Lettering on the "BUFFETT" name on the signs is 5 ft. tall and is visible from nearly a half-mile away. The signs are comprised of zinc panel cladding with aluminum frame and utilize energy efficient LED lighting. The signs were moved at midnight on Monday morning when traffic was minimal. They were transported from the Architectural Wall Systems facility. The signs are the largest fabricated by Architectural Wall Systems. They took approximately six weeks to assemble. Cost - $323 million - the largest project ever for UNMC/Nebraska Medicine.